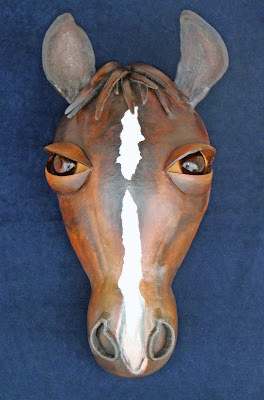 I recently completed a gourd horse mask for someone who has had a passion for horses since childhood. She had seen a zebra mask I created a year or so ago and asked if I could make a horse. I love doing special pieces for people because it forces me to do new things, however, it all depends on having the right gourds. You can create illusions (the texture of fur for example) with two-dimensional media like paint, but that only goes so far on a three-dimensional shape. It reminds me of that Steve Martin movie based on Cyrano de Bergerac called Roxanne. He goes into a drugstore to purchase some makeup and the clerk tries to show him how to shade his nose to make it appear smaller, but of course it is so long it doesn't make any difference. The stars aligned and I found the gourds for the head and muzzle. Those two pieces were attached and then I started searching for the all important eyes. Once the eyes were cut and secured, for me, it started having a real life force. I know they are just gourds and maybe my imagination can go into overdrive, but this mask had a peaceful presence in my art room...a real gentle soul. The new owner came by to pick it up and said she would call her "Brown Beauty" after a brown Bay horse she played with as a child. We spoke about different kinds of horses and I learned quite a bit, but I mostly I sensed the love she had for equids. It also got me thinking about my own childhood interests and what has carried through to adulthood. I stumbled upon an envelope with old papers and projects from elementary school that my mom had sent a while ago. I found a "Pupil Interest Inventory" from the fifth grade. It was a questionnaire (on a lovely ditto copy--remember that purple/blue ink?) where you had to fill in the blanks. My first reaction was to cringe because I went by "Barbie," but as I continued reading I realized I am not much different than that little ten year old. I was surprised that I wanted to be an artist. I knew that I liked art but I didn't think I wanted to be an artist until I was much older. I also smiled when I read what things I would like to be doing as an adult. I'm pretty much the same. I draw and paint, we have a dog, guinea pig, and two mice, we go camping and hiking, I learned how to ski and enjoyed doing that for many years, and I did take piano lessons, but later found a passion for the guitar which I still enjoy today. How much do we really change?